If you own a small business or work as an independent contractor that specializes in providing services to the public, there is a good chance that you will have to write an invoice in order to receive payment. 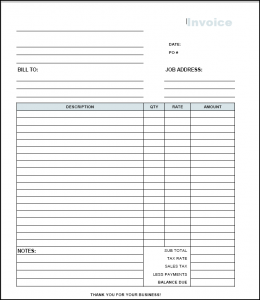 Writing these invoices can be complicated and it is much easier if you take advantage of a payment invoice template. What Does The Document Do? This document basically works as a bill. Anytime you provide a customer with your specialized services, you are going to have to issue them an invoice in order to receive payment. There are lots of different types of these documents available, which can be found on our website. One of the best things about the blank document that we provide is that they are 100% completely customizable. If you want to remove or add any field you have the option of doing so. If you want to print the name of you company or your company’s logo on the document you can. Another great thing about these documents is that they will contain all the necessary information that you need in order to get paid. All you will have to do is edit the texts surrounded by brackets. The world is oversaturated with consultants. This specific type of professional can serve an array of purposes and is always responsible for providing someone or some company with advice. Whether you’re a personal consultant or work within a group consultant scenario, you’ll want to make sure you get paid for the work that you do. This is why many consultants utilize the consultant invoice template on a regular basis. What is this document, how is it utilized and how can it help? Continue reading below to find out. Now, you’ll want to learn about the underlying purpose of this document. Generally, consultants present this document to their clients, as a way to request payment. The overall layout of the document will change depending on the services you offer. If you provide beauty consultation and charge hourly, you’ll want to layout the information within a timed format. Or, you may decide to charge for specific services. If so, this information can be detailed as such on the invoice. Nonetheless, the consultant invoice will make it clear what services were delivered and how much the client needs to pay. When it comes down to it, the potential uses for the consultant invoice are never ending. There are numerous types of consultants and each of them will be able to put the document to full use. If you offer legal consultation, you’ll want to keep record of the hours you’ve put in for a specific client. Once you’re ready to get paid, you can put this information into an invoice format and give it to the client. As a personal consultant, you can replicate the same process using the invoice and making sure you get paid. The invoice can work in all situations, whether you’re offering fitness advice, wedding advice, or investment consultation. As a consultant, it is in your best interest to listen closely to what your client says. Doing so will give you the ability to better serve their precise needs. You won’t have time for unnecessary activities, such as keeping log of your hours. This is why the invoice is so beneficial. It gives you the ability to keep track of the hours you’ve worked and how much you charged for a specific product. You’ll also want to use the document to keep track of the client’s personal details. The invoice can also be used to provide the client with payment details, so they’ll know precisely how to make their payments. Truly, the consultant invoice is a real necessity for consultants, regardless of the specific type of service they deliver, who they serve, or where they reside. As a consultant, you should keep several of these invoices on hand at all times! Being a contractor can be a stressful job. You always have to be on top of your game, while making sure that you deliver quality work to all of your customers. While doing this, you have to keep track of everything that you have done with precise detail. You have to deal with figures, such as payments made, payments received, tax exemptions, plus so much more. You probably spend hours and hours every month creating invoices from scratch. With the contractor invoice template, this will never be a problem. This pre-made document can be incredibly beneficial for all contractors and you’ll learn why below. This type of invoice is a document, which is widely utilized by professional contractors, especially those within the construction industry. Of course, a contractor may be responsible for managing an array of different things, such as trade and supplies. The invoice will help in each scenario. It can keep track of information regarding the current project, the work completed, and the total cost. Whether you’re a construction contractor, janitorial contractor, or perform electricity work, you’ll want to use this document to your advantage and to help make your duties substantially easier. When attempting to setup your own contractor invoice, you’ll want to make sure to include a handful of pertinent details. For starters, your company’s name and logo should be visible on the document. You should also include all of the client’s personal details. Most importantly, the invoice should provide the client with a description of the work carried out, when it was completed, and the number of hours it took. Finally, a finalized price calculation should be given. As a contractor, you have to make a great impression on your clients along with letting them know that you are honest. You also want to make everything as simple as possible. This is why you’ll want to utilize a customizable invoice template. You can use an invoice template to calculate the total of a job by entering the hours that were worked and the hourly rate that you charge. Your customers will be able to match this against the hours that you have on the job and they will know that they were billed fairly. This is truly one of the best ways to establish and maintain transparency between you and your customers. As a contractor, you truly owe it to yourself to utilize one of these templates. It will make your duties easier, while also providing your clients with the peace of mind they deserve.